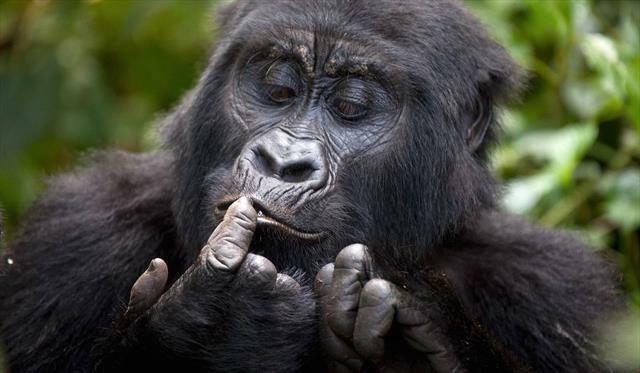 Western (Scientific Name being Pan troglodytes verus) Population of about 50,000, they are mainly found in the forest ranges of Guinea, Sierra Leone, Cote d'Ivoire, Nigeria, Liberia, Ghana, Mali, Senegal, Guinea-Bissau. their appearance is pale face. Eastern (scientifi Name being Pan troglodytes schweinfurthii) A population of about 50,000 they are mainly found in the forest ranges of Uganda, Rwanda, Tanzania, Congo, Central African Republic, Burundi, Sudan and their appearance is long body hair, dark bronze palms and feet, smaller subspecieis. Nigeria (Pan troglodytes ellioti is the scientific name) A population of about 5000, they are mainly found in the forest ranges of Nigeria, Cameroon and their appearance is brownish fur on backs, softer fur. Chimpanzees are an endangered species. Millions of chimps existed in Africa 50 just years ago. The estimated population of wild chimpanzees today is between 200,000 to 250,000 individuals. The remaining chimpanzees are located in forest reserves and national parks. Habitat destruction is the main cause for the drastic loss of chimpanzees. Chimpanzees are also hunted for bushmeat, poached for pets, and susceptible to human disease. The best place for Chimpanzee tracking is Uganda's Kibale National Park, where more than 1,000 chimps live. The success rate in viewing them on a tour is over 90%. Chimpanzee tracking is also available in Budongo Forest near Murchison Falls, at Kalinzu Forest Reserve or the Kyambura Gorge at Queen Elizabeth Park and Semiliki Park. Chimpanzees are social animals, living in communities from 10 to 100 individuals. These communities, known as troops, are hierarchical, led by a dominant male. Troops are comprised of many loose, temporary subgroups of mixed males and females of all ages. Chimpanzees use a system of vocalizations to communicate with one other. They are the smartest animals on the planet, second only to humans. Half of the chimpanzees' day is spent foraging for food. Their diet consists of primarily fruits, but they also eat leaves, buds, blossoms, seeds, stems, bark and resin. Chimpanzees are also known to eat insects, birds and bird eggs and on occasion, they hunt mammals, such as colobus monkeys. Chimpanzees usually move by walking on all fours on the ground. But they are great climbers, and will eat and sleep in the trees. They sleep in nests constructed out of vegetation. The territory of chimpanzee troops can be as large as 200 square miles. Female chimpanzees give birth every five to six years. The pregnancy lasts between seven to nine months. Chimpanzees develop slowly. For the first 6 months, the baby does not leave the mother's belly. Baby chimpanzees are weaned around four years of age. Female chimpanzees reach sexual maturity around 10 years old. They will often mate with several different males. Generally, chimpanzees have black hair that covers their entire bodies except for the face, hands and feet. Their skin is pale but it darkens as they age. Male Eastern Chimpanzees can grow to over five feet tall and weights up to 140 lbs. Female Eastern Chimpanzees can grow to over four feet tall and weights up to 100 lbs. The average lifespan of wild chimpanzees is 40 to 45 years. Located in Murchison Falls National Park, Budongo Forest Reserve is 793 square kilometers of which only 53% is forest and the rest grassland. Budongo Forest boasts of a high biodiversity of 24 species of small animals 9 of which are primates, 465 species of trees and shrubs, 359 species of birds, 289 species of butterflies and 130 species of moths. The forest is renown for its high number of mahogany trees and chimpanzees. The forest is believed to contain some 600-700 chimpanzees. As a result of this great biodiversity two eco-tourism sites have been set and optimized for tour activities - Kaniyo Pabidi and Busingiro eco tourism sites. These two sites have chimpanzees that have been habituated for chimpanzee tracking. Trail networks have been established for nature walks. You get an up-close view of the mahogany trees, iron wood trees and other vegetation. In addition to the chimpanzees and other primate species such as monkeys, one can also view several bird species such as Chocolate-backed kingfisher, the White-thighed Hornbill and Puvel's illadiposis found nowhere else in East Africe. The area is relatively flat and thus easy to trek. Kyambura Gorge is renown for its primate population and the only place with habituated chimpanzees in Queen Elizabeth National Park. Other notable primates one can also view in Kyambura Gorge are the red-tailed monkey, black-and-white Colobus, baboons and vervet monkeys. Kalinzu forest reserve is a natural-ecosystem forest found in the western part of Uganda in Bushenyi district.the forest reserve is home to Chimpanzees, Leopards and two butterfly species which are found no where else in the world, red tailed monkeys, black and white colobous monkeys, Black billed turacos, vervets,bush babies, baboons, L’hoest monkeys, blue monkeys, and also home to a diversity of many plants. The best time to visit Ngamba Island Chimpanzee Sanctuary is at 11.00am and 3.00pm during their pre-arranged supplementary feeding. It is exciting to watch the chimps grapple for food and the way they interact with each other. As a visitor you could luckily get a once in a lifetime opportunity of being one or two chimpanzee’s care taker if they (chimps) choose you. You will get the opportunity to appreciate why they are called man’s closest cousins. They literally mimic all human actions. They will ask you to feed them, walk them around, play with them, talk to you, and do many possible things you would do with/for humans - its totally mind blowing, probably the most unique and closest wildlife encounter you could ever have.